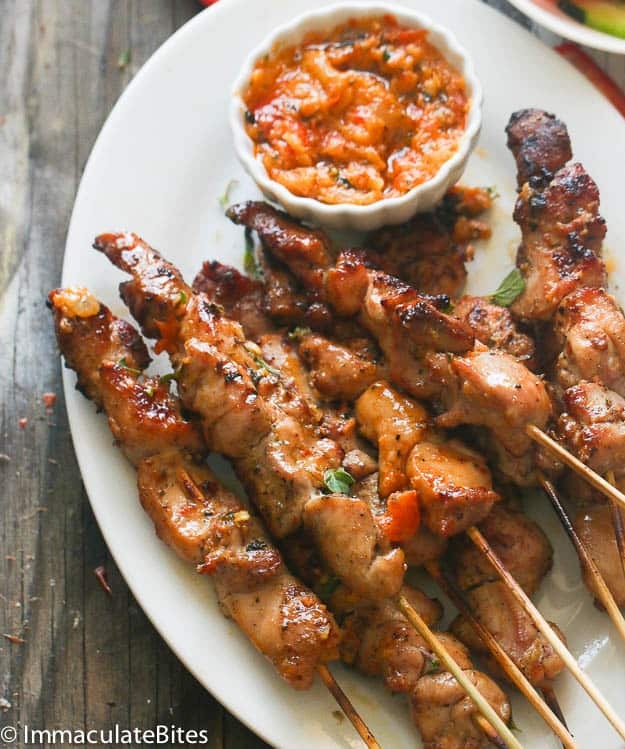 Peri Peri Chicken Skewers – Flavor Packed BBq chicken skewers marinated in a spicy pepper, garlic, lime, basil and oregano sauce .Great for entertaining . Prep the night before let it marinate overnight and grill when ready. 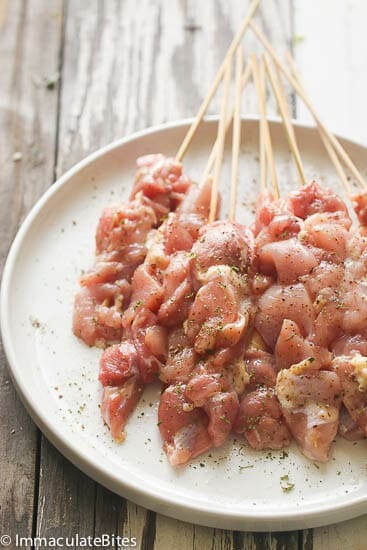 Perhaps chicken skewers are not first thing that pops in your mind. When you think of firing up the grill. 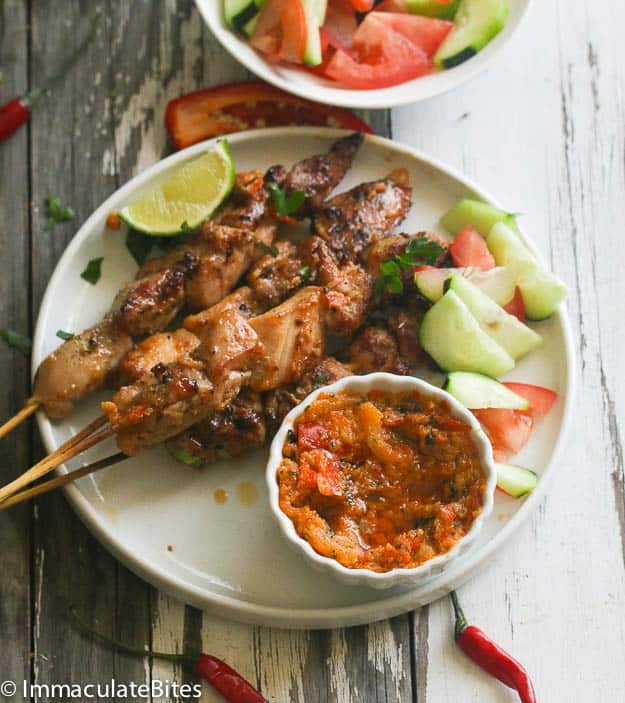 I think you just might change your discernment after you give these Peri Peri chicken skewers a go. These are super flavorful and a cinch to make. After slicing, threading the rest is a breeze. 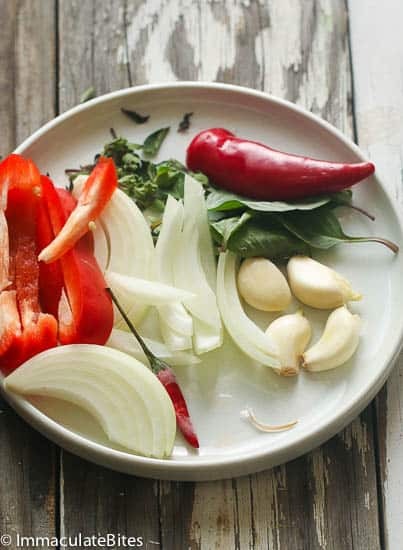 Peri Peri marinade is a complex sauce that I seem to enjoy every now and then. A popular hot pepper sauce made out of chili peppers- enjoyed in many parts of the world. I created a post just dedicated to it right here. So check it out! To learn more. 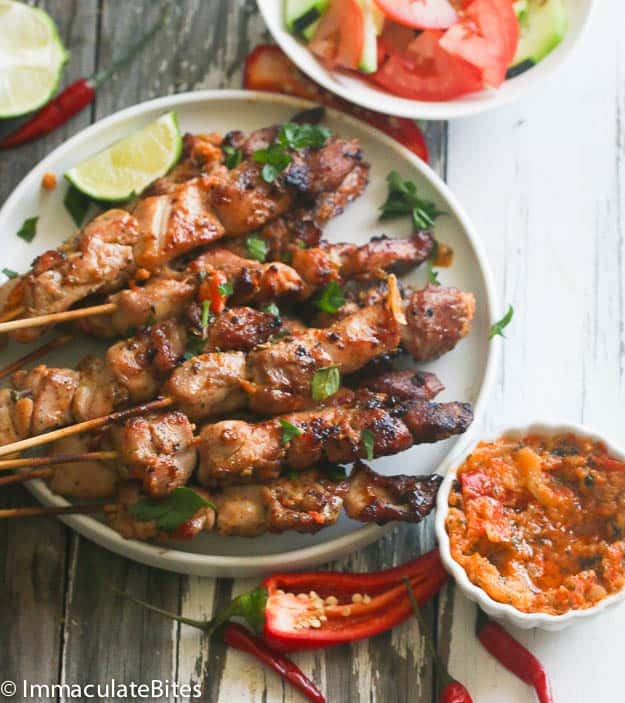 What I like about this peri peri chicken is that it allows you to prepare the skewers ahead of time so you can spend your day relaxing till you are ready to fire up the grill. The marinade is packed with red bell pepper, sweet paprika, fresh oregano, garlic, and peri peri pepper, jalapeno and lemon juice. No exact science here…add more or less of the ingredients. It will still turn out just fine. 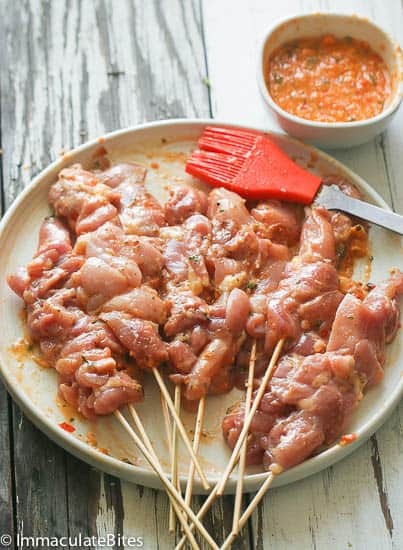 Just like these Mozambique chicken here you can be a little more adventurous and add some coconut milk to it- it helps intensified the flavor and somewhat balances out the heat. You know you can completely eliminate the Peri peri peppers, sub with any hot pepper and/or adjust to taste. YOU DECIDE! You can serve alongside some kachumbari, featured here (cucumber tomato relish) salad or rice. Either way, everyone will be sure to gobble these up INSTANTLY! A word to the wise double or triple up you will be glad you did. 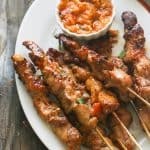 Peri Peri Chicken Skewers - Flavor Packed BBq chicken skewers marinated in a spicy pepper, garlic, lime, basil and oregano sauce .Great for entertaining . Prep the night before let it marinate overnight and grill when ready. 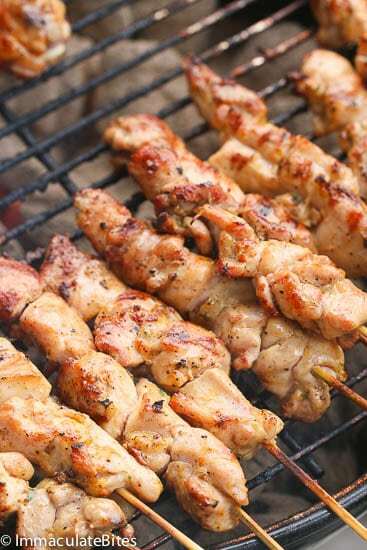 Soak the skewers for at least 60 minutes or more totally submerged in water before using it to prevent burns. You may skip this part if pan grilling. 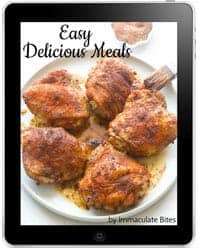 Trim chicken thighs of excess fat and pat dry with a cloth or paper napkin. Cut chicken thighs into 2-inch chunk. Season with salt, chicken bouillon and pepper or adobo seasoning mix. You can either marinate the chicken now or thread then marinate-about 4 pieces per skewer. Making sure the skewer is fully covered with chicken chunks. Place in a zip lock bag, or sealed containers and refrigerate for at least 2 hours, preferably overnight. When ready to grill. Using tong remove excess marinates and reserve. Pre heat grill to medium- high heat. Place chicken over medium heat, and then brush with oil to prevent chicken from sticking. Grill for about 10 to 15 minutes, rotating from sides for even cooking. Keep an eye on it -- if they are browning too quickly, turn the heat down. Grill in batches if you have a small grill. Transfer the skewers to a platter. I’m happy to have stumbled upon this website! I’mI’m definitely gonna try this and lots of other recipes! Glad you are here. Do let me know which ones you make and how they work out for you. Perfect for the season! Thanks for sharing! Really nicee,wish I could try bt I dt ve a grill,can I use my oven? 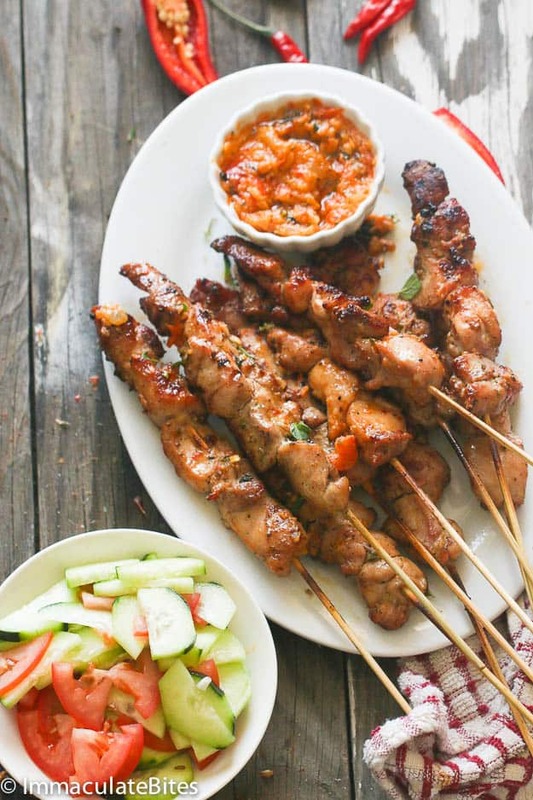 I adore making these skewers on the grill – that peri peri marinade sounds so delicious! I am a vegetarian so I will most certainly take inspiration from your marinade to create a vegetarian recipe with Tofu. I actually fell in love with peri peri chicken in South Africa a few years ago and have been meaning to make some since back in the UK but have not yet managed it. I should rally try your version. Thanks! You definitely going to love this one Sue. Love all the flavors & seasonings for these skewers! And love doing the prep the night before! They look FAB! I was so thrilled to find your page! I have Never been in Africa or eat african food! I will try to make some of your recepies! Thank you for shearing them ! Can’t wait for you to try some of my recipes here, Brita! Enjoy!